You are here: Home » Faith » Why do Catholics venerate relics? The veneration of relics is a fundamentally biblical practice; it is not some sort of innovation in the centuries after Christ. On the contrary, as Scripture reveals, the veneration of relics was widely practiced, in one form or another, by ancient Jews as well. In the Old Testament, the Second Book of Kings details the death of Elisha the prophet. “Once some people were burying a man, when suddenly they saw such a raiding band. So they cast the man into the grave of Elisha, and everyone went off. But when the man came in contact with bones of Elisha, he came back to life and got to his feet” (2 Kgs 13:20-21). This miracle is an early example of relics and the way that God can work wonders through them. In the New Testament, one of the clearest examples is the story in the Gospels of Matthew (Mt 14:35-36), Mark (Mk 6:56) and Luke (Lk 8:43-44), in which people bring the sick to Jesus so that they might “touch only the tassel on his cloak,” and by coming into this direct contact with him, be healed. The Acts of the Apostles tells of an early practice of venerating relics: “So extraordinary were the mighty deeds God accomplish at the hands of Paul that when face cloths or aprons that touched his skin were applied to the sick, their diseases left them and the evil spirits came out of them” (Acts 19:11-12). So, with all of this in mind, what does the church teach about the veneration of relics? Furthermore, it is not just their bodies, but “objects that belonged to the saints, such as personal objects, clothes and manuscripts are also considered relics, as are objects that have touched their bodies or tombs such as oils, cloths and images” (No. 236). Catholics venerate relics — not because the individual saint is worthy of some sort of worship, or because there is anything inherently powerful in the relic itself — but because the relics are used by God as occasions of grace and wonder, and to show his power and love. Many young Catholics, who rarely hear about relics in religion or church classes, as well as non-Catholics, may have questions about the practice of venerating relics, said Bishop Edward Braxton of Belleville, Illinois, in an All Saints’ Day reflection in 2015. 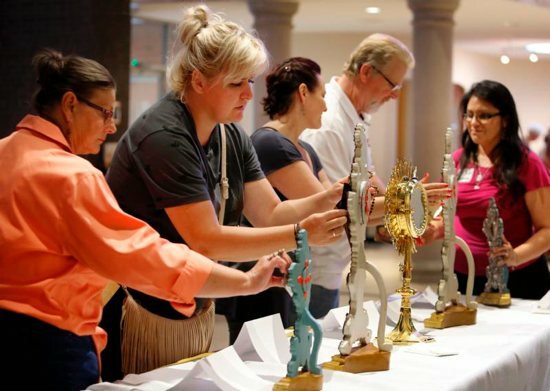 “There are many Catholics for whom the veneration of relics is not a part of their spiritual lives,” and yet are still devoted to the saints, the bishop noted. “In faith, we hold out the hope that when we pray in the presence of a relic of a saint’s body (which was once a temple of the Holy Spirit) with an open mind, an open heart and an open spirit, we are disposed for the grace of God to help us to live the virtues exemplified by the faithful disciple of Christ whose body we venerate,” he said.